Twice Baked Potato Casserole - the classic potato dish in casserole form filled with red potatoes, cheese, sour cream, bacon and more. It's the perfect side dish to any holiday meal or dinner. Pierce potatoes and bake at 400 for 40-45 minutes. Let potatoes cool 10-15 minutes and cut into 1 inch cubes. 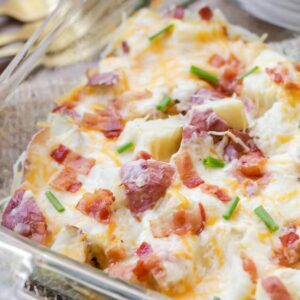 While potatoes are cooling mix sour cream, salt, pepper, bacon, and cheeses in a bowl. Set aside. Spray 9x13 pan and layer with half the potatoes and then half the sour cream mixture. Layer rest of potatoes on top and then top with sour cream mixture.